Hi everyone! Just a quick update on my painting and decorating movements around the local area. I’ve got a nice varied work schedule over the next couple of week starting with a staircase in Lacock, nr Melksham. 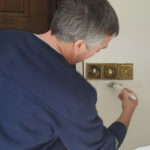 I’m then on to one of my best clients, Strakers the popular Wiltshire estate agent who often employ me as their Chippenham decorator, where I’ll be carrying out some room only maintenance work on some buy-to let-properties in Chippenham. Once finished in Chippenham, I move onto a 7 day decorating project in Market Lavington, nr Devizes where I’ll be working on a property improvement project designed to help achieve the asking price for a property due to go to market. I hope to post some photos very soon. If you would like a quote for a decorating project please get in touch.